Reader advisory: I’ve been slacking on this blog, because I haven’t had time to write. So I’m going to make up for it here and go on and on at lengths nobody but me will want to finish reading. If I actually finish, uh, writing it. So, herewith, another post on Vermeer. Ironically, seeing Girl with a Pearl Earring at the Frick, along with three other works from the greatest Dutch master, isn’t what made me want to write about Vermeer again. Nor did I get the urge to write about probably the greatest Western painter in history (who was ignored for a couple centuries) after hearing, by contrast, how so much lesser art is selling like gourmet hotcakes in Miami right now. The itch to write this actually began while I was finishing up a month of work on a recent painting for my solo show next May at Viridian Artists. This is the heart of Chardin’s still lifes: what you see in his paintings leaps back and forth in that contrast between the texture of the paint and what it lets you see. I think something similar happens with a Vermeer, though I’m probably in the minority on that. Most people, astonished at how alive and present his images look, often don’t notice how little he actually needed to render in paintings that are, for the most part, pretty small. He figured out how to make you imagine what isn’t there. What makes a painting great happens subconsciously, even though almost everything that makes a painting good can be learned and is a matter of disciplined craft. Except for maybe the most rigorous hyper-realist, what’s distinctive about a particular artist’s touch, his or her “style” in Susan Sontag’s sense, is what the artist can’t help but do, and doesn’t consciously choose. It’s like an accent. You aren’t aware you have one, even though it may be what other people hear first, when you speak. The expertise, the repeatable craft, is what catches the eye of a new viewer, but the subconscious way in which an artist warps what he sees gives the painting its unique personality. What a painter can’t keep from doing—where he or she finds it necessary or unavoidable to alter what’s seen, simply in the way that person paints—that’s where a painter’s quality comes alive. 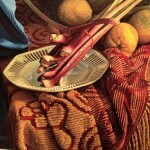 And if these modifications are consistent from painting to painting, as they are with Vermeer (though they are extremely subtle and hard to describe in his work), then you have a “style” that itself conveys as much as, or more than, the sum of what the artist consciously wants you to see. Unlike traditional models, Vermeer’s camera obscura would have used two mirrors and a four-inch lens. The image would have been projected through the lens onto a 7-inch concave mirror fixed to the wall opposite. This mirror bounced the image onto a smaller 2 x 4-inch mirror situated next to the canvas. If Vermeer used this system, he would have been able to paint with little movement of his head and capture the light and detail more accurately. Did I point out that Jenison was obsessed? To get things right, he actually built a duplicate of the harpsichord in Vermeer’s Music Lesson. The project took years. As a result, his finished painting is an astonishingly beautiful piece of work, as lovely as anything painted in the Dutch Golden Age, and as finely crafted as, and far more subtle than, what many photo-realists paint these days. It draws you in and invites you to discover one beautifully rendered detail after another and it carries a lot of that peaceful, balmy sense of upper middle-class contentedness that distinguishes Vermeer from so much of the antagonism associated with art since the birth of modernism. Now, since the movie is backed by Penn Jillette, of Penn & Teller, it would appear there’s a spirit of debunking going on: See? Vermeer was no otherworldly genius, no magician of paint. He was a trickster! A complete amateur with no training can paint a Vermeer! Most advance reviews, though, don’t dwell on the question of whether Jenison’s painting is equal to a Vermeer, but rather on how his quest simply offers the viewer a greater appreciation of the slow, painstaking craft that produced fewer than 50 paintings in an entire career. Based on the amount of time Jenison devoted to his single painting, by comparison, Vermeer was the Roadrunner to Jenison’s Wile E. Coyote. Tim Jenison . . . is a nonstop tinkerer, building giant model airplanes and battle robots, and learning to fly helicopters. Curious, careful, soft-spoken, and comfortably schlumpy, he comes across more as a neighborhood professor you might see at Home Depot than as a guy who owns his own jet. He decided to construct a version of a device that Vermeer himself could have built and used. And since he had no training or experience as an artist whatsoever, he figured he was the ideal beta user of whatever he rigged up. Vermeer was a supremely intelligent painter, perhaps one should say an intellectual painter; but at the same time he had I believe an extraordinary capacity for switching between this intellectualized, rational eye, and what one might call a perfectly ‘idiotic’ eye, with which he was able to see luminous patches of hue and tone, quite independent of the real-world objects from which they emanated. As Gowing puts it, in this mode of seeing, “Vermeer seems almost not to care, or not even to know, what it is that he is painting. What do men call this wedge of light? A nose? A finger? What do we know of its shape? To Vermeer none of this matters, the conceptual world of names and knowledge is forgotten, nothing concerns him but what is visible, the tone, the wedge of light.” Aldous Huxley in his book The Doors of Perception describes the world seen under the influence of mescaline as being like a painting by Vermeer: “Things without pretensions, satisfied to be merely themselves, sufficient in their suchness, not acting a part, not trying, insanely, to go it alone…” The drug, as one might say, switches off the higher-level powers of conceptualisation, leaving the eye to see just light and colour – as the painter was able to do without the benefit of artificial stimulants. So. I haven’t even seen the movie yet, but based on what’s been published on the Web, it appears that Jenison’s painting differs from Vermeer in a number of ways. First of all, in the photograph at NPR’s site, if I’m right in assuming the painting is resting, face-up, on a flat surface next to Jenison, it’s larger than the original. He has given himself more canvas, which makes it easier for him to indicate more precise detail. Vermeer kept his images small, making it harder to do that and therefore required him to find ways to suggest detail without showing all of it. Jenison’s painting captures the pixelated weave of a typical Persian carpet’s mandala pattern. It reminds me of a still life from James Valerio decades ago in which a flocked-looking bedspread is depicted with astonishing, uncanny precision. Jenison renders every last digit in that fabric’s pattern. Vermeer never did. He let go of that detail and invited you to imagine it on your own, which you do. In Jenison’s treatment of the harpsichord’s legs, the same kind of literal rendering holds true: you’re clearly looking at lathed hardwood, the color of the wood perfectly conveyed. Yet Vermeer doesn’t bother with that. In the original, you see the light in the room when you look at those furniture legs and the legs themselves all but fade into ghosts in the glow of the sunlight shining onto the floor in front of the instruments. Vermeer is more interested in the invisible light in the foreground air than the legs seeming to fade away behind it. The color of Jenison’s bass violin is a wonderful brown, but Vermeer’s violin has a honey-colored hue missing in Jenison’s—and that hue calls out to yellows elsewhere in the harpsichord. 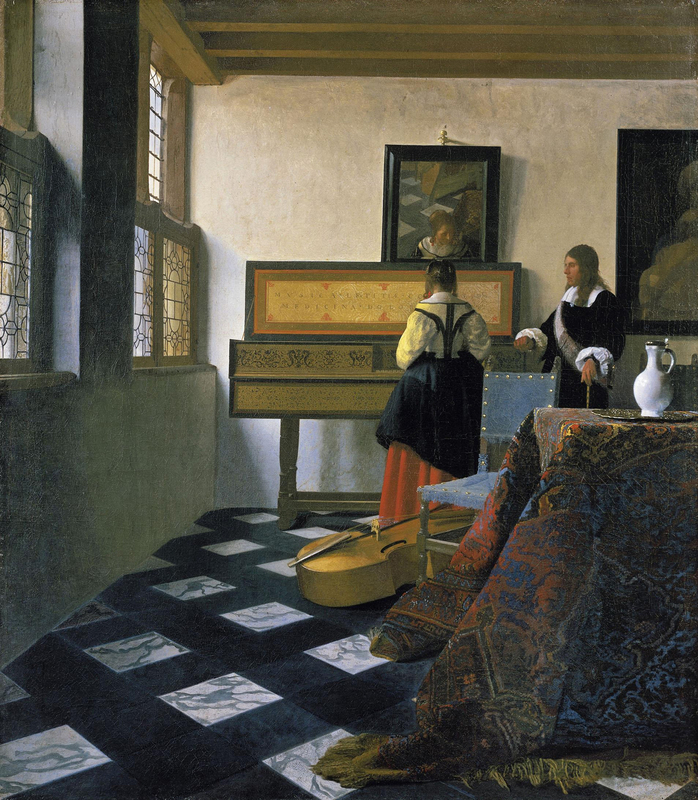 The painting Jenison chooses to hang on the wall behind the instructor seems miscalculated and draws attention to itself in a pleasant way, while Vermeer’s remains almost colorless, serving as just another rectangle in a row, from window, to harpsichord and mirror, to chair, and then the painting on the right—it echoes and completes the other shapes but otherwise almost isn’t there. It doesn’t draw your eye away from the lesson itself. Most of all, Jenison loses the marriage of the yellow blouse to the blue chair in Vermeer’s painting. Vermeer’s cornflower-blue was one of his most personal and consistent choices, usually paired with a pale yellow. Girl With a Pearl Earring offers probably the most famous example of those colors. If you’re going to do Vermeer, you pretty much have to tackle those colors. Jenison darkens the chair in an elegant way, showing off the shine of the brass tacks to greater advantage, but he loses the music of yellow and blue in the process. 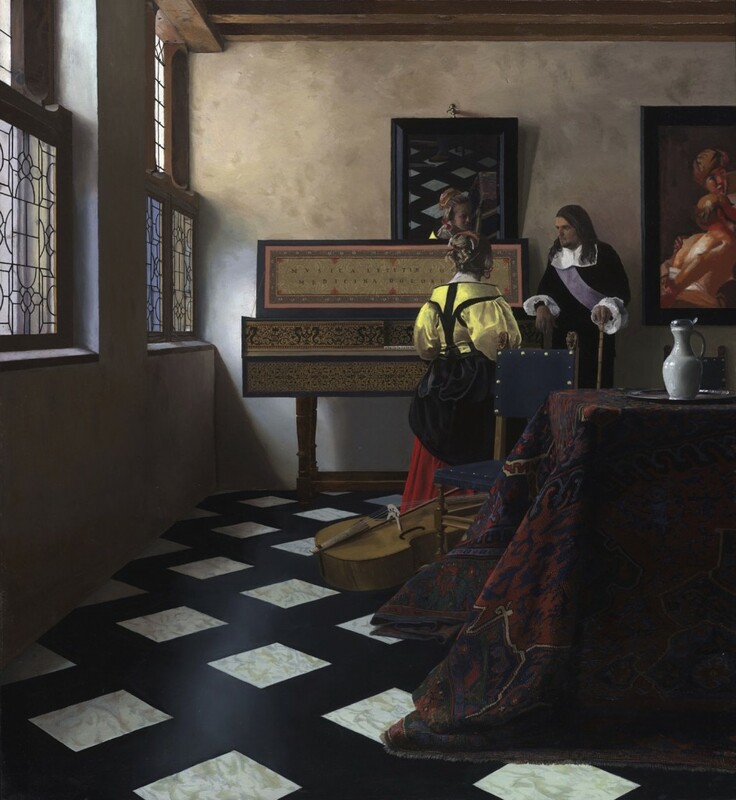 It doesn’t take anything away from his achievement: he wants to show how Vermeer’s technical mastery can be equaled. He succeeds. The question is: what does one do with the technology at one’s disposal? Vermeer does one thing; Jenison does another. Those two colors are an element of what gave soul to Vermeer’s work. He relied on a particular blue and a particular yellow, and I think it was partly because they enabled him to bring the sun and sky into a room, in harmony with the light they were bestowing on Delft from outside his windows. In the original Music Lesson, the blue and yellow are very faintly echoed, as well, in the color of Vermeer’s wall where the shadow has the faintest violet tint and the sunnier parts of the wall lean toward yellow. Jenison’s wall seems mostly brown. These are all choices it would be possible to avoid, if you were really trying to forge a Vermeer. Yet there are other, more elusive and significant ways in which Jenison’s painting departs from the master’s work that underscore why Vermeer is so revered. Granted, it may be the photograph and the reproduction altering Jenison’s color, but he changes the way the reds work in the original Vermeer. In Jenison’s painting, the girl’s skirt has become a distinct red that stands out on its own, linked to the reddish tones in the carpet, a bow in the girl’s hair, reflected in the mirror, the details in the harpsichord’s lid, and the bloody-looking colors in the painting hanging on the wall. (That painting seems like a quirky, intentionally defiant touch from Jenison, a discordant announcement that he has no intention of being Vermeer, just proving that he can equal or surpass the master on a technical basis.) Yet Vermeer’s warm tones lean toward orange rather than red, and they are placed to serve as a kind of pivot for the rest of the painting: the skirt, the carpet, the details in the lid, and—here is where the difference is significant—in the face of the instructor. The way Vermeer indicated the shadowed areas of the man’s face share the same orange as the other three locations in the painting. Not only does that orange facial tint pull the man into the woman’s field of gravity, it helps unify the entire image, and, most of all, works the way the harpsichord legs work: the face seems to dissolve into the warmth of the light and simply glow as a condensation of the light rather than an object with its own distinct reality. This is where Vermeer’s brilliance became unique: he could enable you to see an entire scene where everything has an utterly convincing sense of weight and presence, and yet he also, at the same time, lets you to see nothing but a field of light and color so that all the objects in the painting seem to be made of that light, the way particular notes exist only as part of a song that surrounds them. Proust celebrated Vermeer’s work, I think because his aims were so similar to what Vermeer accomplished. Both Proust and Vermeer portray everyday routines with amazingly particular detail–yet in a context that makes all of it serve as a window into a sense of the eternal. You are looking at a fleeting moment that, paradoxically, feels timeless. This is where Vermeer couldn’t help himself: where his involuntary choices (only an oxymoron will serve, here) in simply trying to get things exactly as he wanted them to look, always seemed to open a little door of perception into what’s completely immune to historical, economic, social, and even personal influences. The quality of light in a Vermeer painting seems to expand to convey intuitions about time itself: and that’s where words about what Vermeer attained especially fall short. Looking at a Vermeer you have a sense that immortality isn’t an illusion, and yet all you’re actually seeing is a woman pouring milk from a jug. Looking at Jenison’s work, you see a life you wish you had, full of things you wish you could own, with people it would be fascinating to know. Yet there’s nothing transcendent in that light, that color. It’s a superlative painting, but it isn’t Vermeer, and the ways in which it falls short show why Vermeer’s achievement was more than the sum of his methods. Jenison’s invention turned him into a fine painter, but Vermeer remains out of reach.